Used from Broadway to Britain's West End, QLab software is the tool of choice for many of the world's most prominent sound, projection, and integrated media designers. 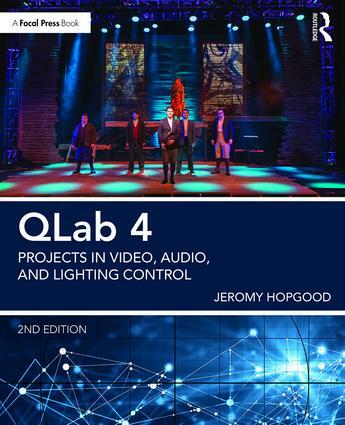 QLab 4: Projects in Video, Audio, and Lighting Control is a project-based book on QLab software covering sound, video, lighting, and show control. With information on audio, video, and lighting system basics and the more advanced functions of QLab such as show control, network capabilities, projection mapping, video effects, and cue cart integration, each chapter's specific projects will allow you to learn the software's capabilities at your own pace. In addition to the text, a companion website hosts project files, instructional videos, and more. What Kind of Connector(s) are Needed? 22.2 What is MIDI Show Control? Jeromy Hopgood is a Professor of Entertainment Design & Technology at Eastern Michigan University. In addition to his teaching, Jeromy has designed more than 150 plays, musicals, dance and opera productions over the last decade. His work in scenery, lighting, projections and sound has been showcased at professional theatres across the Southeast and Midwest United States. He worked at the Williamstown Theatre Festival in its Tony-Award-Winning season and is an artistic associate at the Michigan Shakespeare Festival, where he is the resident scenic designer and technical director. Professor Hopgood is a long-standing member of the United States Institute of Theatre Technology. In addition to presenting panels on projection design, media, and educational theatre at numerous USITT annual conferences, he is also a regular presenter at Live Design International.